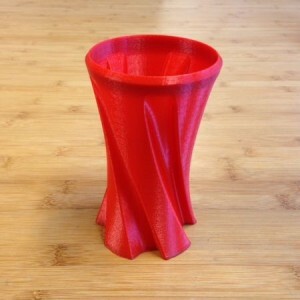 Please find the first 3D print file we want to share with you. A nice little vase with a twist ! Above sample was printed on a Leapfrog Creatr without support structure and layer heigth 0.2mm. Printed size is about 19 x 11 x 11 cm. If your printer has a smaller built size then you can scale the file in your slicer software. 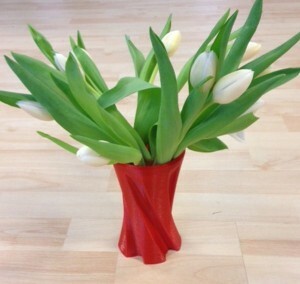 Warning: we strongly advise before using the print as an actual vase with water, to first test it thoroughly for a longer period of time for water proofness. Your printsettings and the material you use for printing can affect the water proofness. Enjoy printing and check back soon for more printable files ! Please feel free to download our 3D files for your printing pleasure. The vase was created by Studio STOUT and all rights are reserved. The print files we share, are free for private use only. In case there should be a commercial interest in any of our 3D designs please first contact us to make an agreement on this. Do you want any custom made 3D files, feel free to contact us so we can disucss the possibillities.